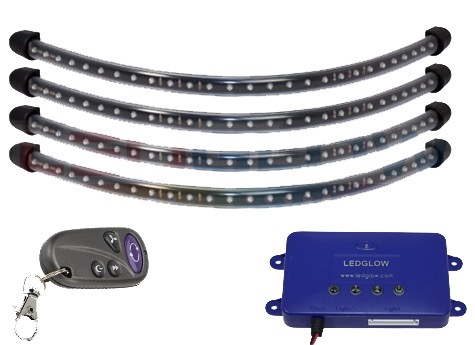 LED Golf Cart Underbody kit is a 4-pc. multi-colored flexible tube kit designed to illuminate your golf cart. Includes a total of four 24" flexible tubes with 27 ultra bright LED's per tube giving you a total of 108 wide angle LEDs. Draws less than 3 amps. can bend and flex to fit in tight locations on your cart. This kit allows you to change the color with the push of a button. The included contral box features numerous patterns such a strobe, fading, chasing and sound activated effects. All mounting hardware and detailed installation instructions are included.